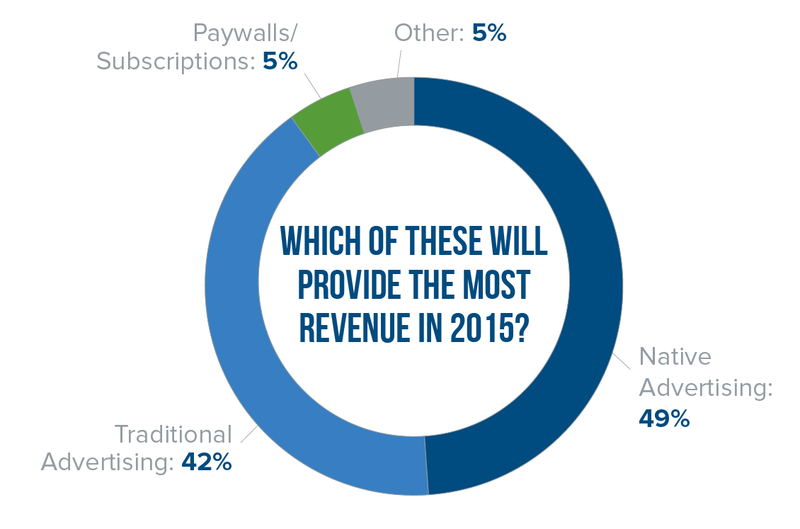 Get our free State of the Media 2015 Report today! Digital and social media journalism continued to boom. 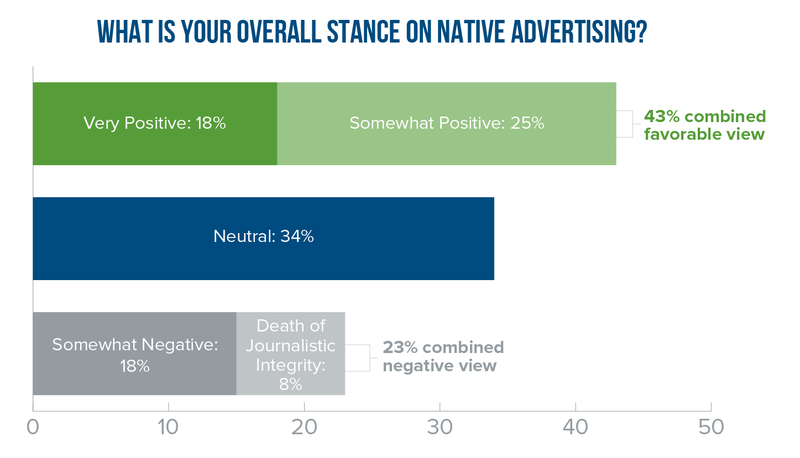 More and more outlets adopted native advertising as part of their content strategy. Mobile compatibility and digital video were being embraced with more frequency. In 2014, new and continuing developments persevered and pushed the boundaries of the newsroom—and with these developments emerged a sense of excitement for the future of media. 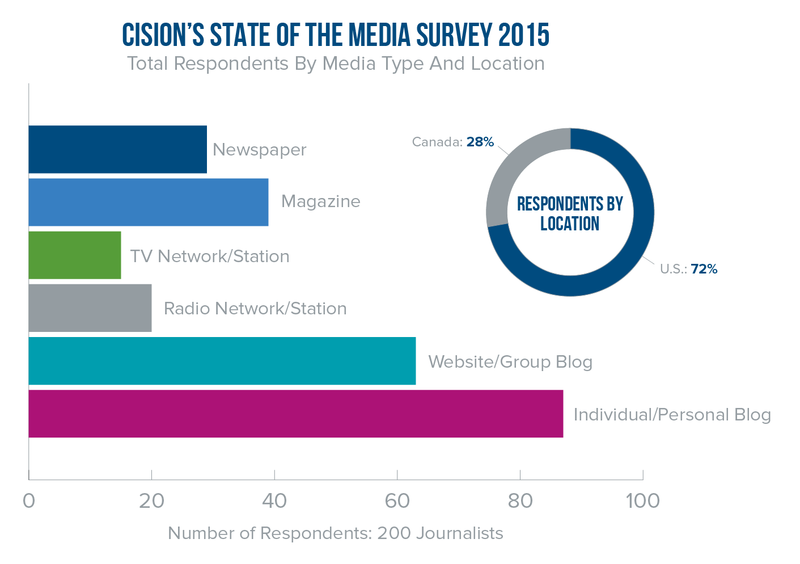 This report details the top media trends and events, curated from Cision’s State of the Media 2015 survey of journalists, bloggers and influencers, as well as the reporting of Cision’s Media Research Team. Read on to understand the biggest changes and challenges facing the media industry and how this evolution impacts how we tell our stories. 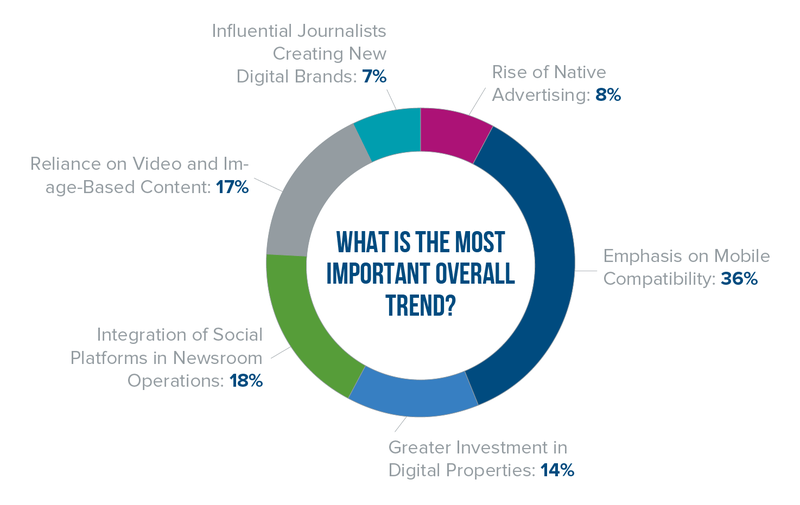 Rebranding and reorganizing were some of the most common themes among media outlets in 2014. Taking center stage were big-name media companies that sought to reinvent themselves in terms of operations, offerings, products and personnel, going beyond the scope of traditional news. 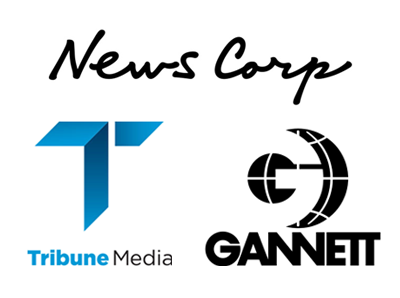 Tribune Media Company, Gannett Company and News Corporation all separated their broadcast holdings from their print products in an effort to boost value and opportunities for their brands. These moves were preceded by the spinoff of Time Inc. from the Time Warner broadcast division, as well as the merger of the Journal Communications and E.W. Scripps broadcast entities and the spin off of their newspaper holdings into a separate public company. In most instances, splitting broadcast and print operations proved prescient and beneficial—at least on the broadcast side. Gannett and Tribune Co. immediately turned their focus toward the acquisition of television stations. Though Gannett did start this process in late 2013 by acquiring the Belo Company—a transaction that increased the number of Gannett-owned TV stations from 23 to 40—they continued this trend in 2014, purchasing six stations from London Broadcasting Company, including Texas stations KCEN-TV (NBC), KYTX-TV (CBS), KIII-TV (ABC), KBMT-TV (ABC) and its digital subchannel KJAC-TV, KXVA-TV (FOX) and KIDY-TV (FOX). That’s not to say Gannett was only interested in television or strictly news content. In April 2014, the company made a deal with The Weinstein Company in efforts to develop movies and television shows. Gannett also established a relationship with Debmar-Mercury, a television syndication company, with the intent to develop, produce, distribute and test multiple new, interactive television shows—as opposed to testing a single traditional pilot—in the marketplace. Shortly after the announcement of the spinoff of its television and print products, Tribune Co. also focused on bulking up its broadcast and entertainment-related holdings. In April 2014, the company’s technology and innovation arm, Tribune Digital Ventures, agreed to acquire TV by the Numbers, a source of television ratings analysis and programming news. Additionally, Tribune Digital Ventures relaunched entertainment website Zap2it, in an effort to bolster Tribune Co.’s entertainment data business and help TV fans find programming on both TV and streaming services, including Netflix, Amazon and Hulu. The divorce of print and broadcast perhaps intimated the impending demise of the print world. The many business changes and reimagined content models that large media companies put forth in 2014 ultimately led to job losses as the newspaper publishing industry found themselves with reshuffled newsrooms and redefined roles that had shifted toward an emphasis on digital media. Leading the pack yet again was Gannett. After announcing the spinoff of its distressed newspaper properties, the company launched the “Newsroom of the Future,” an initiative that aimed to standardize and digitize job roles across the company. The initial changes impacted five newsrooms: The Tennessean in Nashville, Tenn.; The Asbury Park Press in Neptune, N.J.; The Greenville (S.C.) News; The Pensacola (Fla.) News Journal; and The Asheville (N.C.) Citizen-Times. All employees were given the opportunity to reapply for updated and renamed newsroom positions, such as Community Content Editor, Audience Analyst, Planning Editor, Engagement Editor and Content Coach. Traditional photography, production and beat editor roles were to be eliminated, while leaving some room to hire multimedia-focused reporters and producers. In creating these newsrooms, Gannett’s intent was to cut newsroom staff by 15 percent. Following the rollout of the plan in August 2014, USA Today laid off 60 to 70 newsroom employees, many of whom were decades-long veterans. Subsequent months saw “stealth layoffs” at other Gannett properties such as Burlington (Vt.) Free Press; Tallahassee Democrat (Fla.); and Arizona Republic in Phoenix. The New York Times had its fair share of shake-ups in 2014. In addition to the leaked The New York Times innovation report that painted a dire picture of the paper’s digital strategy, there was also the very public dismissal of Jill Abramson, the first woman to hold the executive editor position in the history of the daily. Abramson was replaced by Dean Baquet, the first African-American executive editor at the Times. Eventually, layoffs ensued after a buyout quota was not met in early December. Twenty-one people were laid off that month, many from the paper’s video team, in addition to the approximately 80 people who were among the stated buyout. The aim was to reduce newsroom staff by 100 employees, due to budget cuts and a new digital strategy. Other major dailies, such as The Washington Post and Chicago Tribune, also focused on the redesign, growth and expansion of their digital newsrooms. 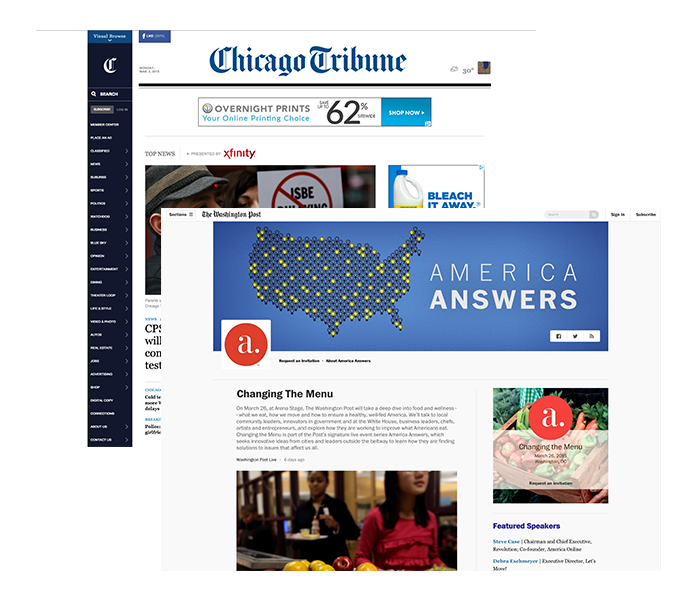 In August 2014, Chicago Tribune relaunched its next-generation website featuring more multimedia content and a better user experience. The new site signified “important new revenue opportunities for the Tribune as it looks to shift dollars from print to digital sources,” the paper reported at launch. “Premium content will be emphasized to encourage digital subscriptions, while clearly marked native advertising and sponsored content will be incorporated. The Washington Post also underwent a number of digital changes since Amazon founder Jeff Bezos acquired the paper in August 2013. The daily launched several new sites and blogs including America Answers, an event series that documents how cities are solving national issues locally, and PostEverything, a site dedicated to broadening the discussion beyond what’s covered elsewhere. I believe we are getting away from the days of a reporter heading out of the office with notebook in hand. Those situations are still there, but not so common. We are a creature of the Internet now, whether we like it or not. Broadcast media also pointed its rebranding efforts toward digital transformation. With the massive appeal and popularity of streaming services like Spotify and Pandora, broadcast radio took necessary steps toward attracting broader, more digitally inclined audiences. In September 2014, Clear Channel, the largest radio operator in the United States, renamed itself iHeartMedia. The rebrand was an attempt to reveal its shifting focus to digital and reinforce its goal of becoming a multi-platform, multi-device-driven network. The rebranded company now owns 859 radio stations in more than 150 markets and sends more than 90 million monthly unique visitors to its digital properties. Elsewhere in broadcast media, New York Public Radio secured a $10 million grant from the Jerome L. Greene Foundation, money geared specifically toward enhancing the station’s digital capabilities. TV newsrooms continued to loosen their programming structure by letting their audiences decide what they wanted to see. As TV audiences continued to adapt to new social platforms, newsrooms learned that they had to do the same. In December 2014, ABC’s “World News Tonight with David Muir” launched “Facecast: The One Thing,” a one-minute news roundup for Facebook users. The segment features the day’s top stories and trending topics and is shot behind the scenes at ABC News headquarters in New York City. It is the first ever daily newscast for social media hosted by an evening news anchor. Local TV stations also started getting viewers involved in their content. Earlier this year, ABC began utilizing user-generated video for their news by partnering with Storyful, and other local stations have employed the coverage of “weather watchers” who keep track of the weather in their neighborhoods. Initiatives related to rebranding and restructuring were not the only sweeping changes of 2014. The year also solidified the importance of native advertising and sponsored content, as both print and online publishers embraced a matured native ad model. In March 2014, The Wall Street Journal jumped on the native advertising bandwagon and launched WSJ. Custom Studios, a content division that offers the paper’s first native ad products, called Narratives. In June 2014, Yahoo announced native ad initiatives that incorporated recently acquired Tumblr and hosted microblogs as native ads. Other traditional media outlets, such as Forbes, continued to embrace native ads by adding bloggers and pay-to-play brands with different levels of advertising control. Meanwhile, new media brands, such as BuzzFeed, continued to earn six-figure investments thanks in part to their highly controlled, native placements. Looking beyond new revenue models, 2014 was also the year of a new breed of media entrepreneurs—those investing their own capital to create new media entities. When Ezra Klein left The Washington Post and announced his new startup, Project X, the media industry grew curious and excited at what venture would unfold. Project X turned out to be Vox Media, a digitally native business optimized for the current age. The announcement marked yet another established journalist stepping away from a mainstream publication to create content in uncharted waters. Walt Mossberg and Kara Swisher, executive editors of AllThingsD, withdrew their partnership with Dow Jones & Company to launch their own venture. In January 2014, a site called Re/code emerged, offering independent tech news from influential journalists in technology and media. Then there’s The Intercept, a publication providing a platform for adversarial journalism, which initially focused on news surrounding the documents leaked by NSA whistleblower Edward Snowden. It was launched in February 2014 by Glenn Greenwald, Laura Poitras and Jeremy Scahill, and is backed by philanthropist and eBay founder Pierre Omidyar. We’ve seen that most of our readers visit our websites via mobile devices such as smartphones and tablets. 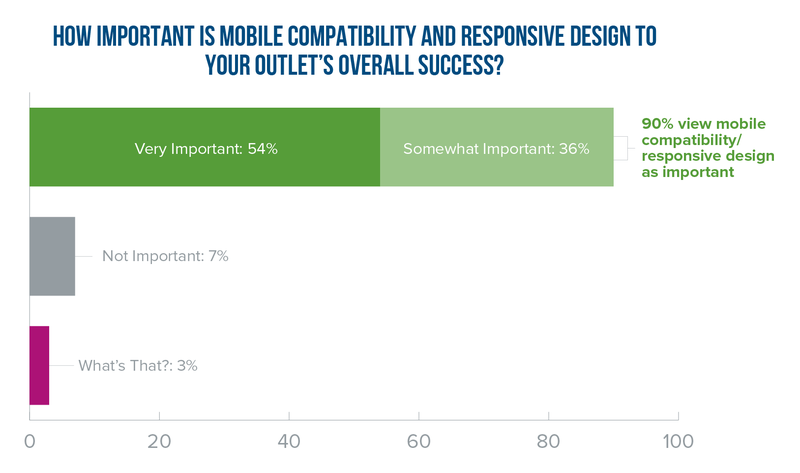 Creating a friendly user experience on mobile is a necessity—not an option. Major media outlets have recognized the benefits of mobile and have started investing significantly. Yahoo made an aggressive move by launching Yahoo Gemini in February, the first unified marketplace for mobile search and native advertising, allowing advertisers to buy, manage and optimize their mobile search and native ad spend in one place. Due to the increased demands of mobile ratings, Nielsen began counting viewers who watch shows via mobile apps on tablets, phones and other handheld devices in their data. With the ease of mobile, online video consumption has skyrocketed. A 2014 first quarter report from Global Video Index found that 21 percent of all online video viewing worldwide took place on smartphones or tablets, a 532 percent increase from just two years ago, reported Digital Content Next (Click to Tweet!). “Video is the new king,” says Ryan Bloom, chief editor at Gaming Illustrated, a website dedicated to video gaming industry news and reviews. With record growth in the digital video ad market and major media brands pouring cash into the medium, digital video saw a huge resurgence last year. NBC News announced at the beginning of 2014 that it would invest in NowThis News, a startup that focuses on short-form video news for social channels that has the potential to go viral. In April, Univision launched its first English-language video network, The Flama, geared toward young Hispanics with a digital, mobile mindset. Also, AOL became its own digital video powerhouse, racking up more than 1.2 billion monthly views on its video library—the result of the company’s $405 million acquisition of video advertising platform Adap.tv, which the company bought in 2013. It’s probable that 2015 will deliver more of the same—reimagined newsrooms, broadcast acquisitions, new media entrepreneurism and an emphasis on mobile and video. But the year ahead might also bring huge structural changes based on trends we are just beginning to notice and trial. Namely, as journalists, bloggers and influencers jostle for the attention of content consumers alongside marketers, advertisers and public relations professionals, the shift will be toward providing stories that are more resonant and easily digested than ever, within a framework that continues to upend what we consider to be traditional media. “I think we will see… less reliance on long videos and prose, more reliance on ‘fast and dirty.’ As audience attention spans continue to dwindle, journalists need to learn to deliver the pertinent facts even faster than ever,” says Nicole Etolen, blogger at Pretty Opinionated. Chris Aung-Thwin, editor of AskMen, sees it similarly. ‘Filter’ will replace ‘curate’ as a buzzword. The trend will be less about reporting news and more about summarizing and providing easily understandable context. And with such fervent competition for today’s mobile and digital users’ attention comes a change in the way we call on our audiences to engage. Monica Marino, blogger at Marino Bambinos, thinks the next big thing will be “removing blog comments all together as things move to social media”—a move that Reuters and Re/code began experimenting with in November. Overall, we can expect the near future of media to be one where companies and entrepreneurs prioritize the expedition of the narrative, delivery and curation functions of news and entertainment. As content creators and consumers influence the way stories are packaged and distributed, publishers will continue to seek out newer and more revolutionary business and revenue models—and how we decide to qualify the very definition of media will continue to evolve. *Chart data may not add up to 100 percent due to rounding of figures to the nearest whole number.